4000-2200 BC New Stone Age Axe found in churchyard in 1922. 1500 – 1000 BC Middle Bronze Age cremation urn found on Guiseley Moor in 19th Century. Roman Road runs over Guiseley Moor – leads to Ilkley. Saxon History: The name Guiseley is thought to originate from the Saxon settlement started by Gislic – Gislic’s glade or clearing. Settlement probably near the spring now called Guiseley Wells and the present day church; possibly 7th Century. 9th Century Anglo Saxon Cross: fragments found in a wall in Guiseley Church (Grade 1 Listed building). The village was a farming community and continued to be centred on the Wells area and Church. Also domestic production of woollen cloth. 1086 The Domesday Book: Guiseley listed as part of the manor of Otley, including Ilkley, Pool, Hawkesworth, Menston and Burley. Value of whole manor listed as worth £10 in 1066, just £3 in 1086. ‘The largest part of this manor is waste’. William the Conqueror granted the manor to the de Ward family. Their moated manor house was to the south of the Church. Part of the moat still exists as a pond in the grounds of the former rectory. 12th Century: Parish of Guiseley created to include Esholt, Yeadon, Rawdon & Horsforth. Medieval Farming: Tofts (Cottages) & Crofts (Long, narrow plots or gardens) pattern. Rare surviving example to East of Town Street (to North of Queenway). 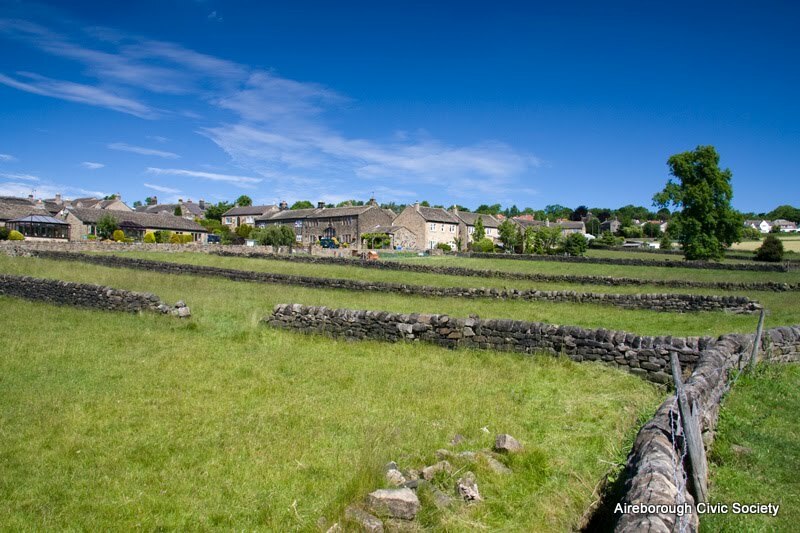 13th Century: De Wards gave Corn Mill and some land to Esholt Nunnery – the Nun Royd area (meaning Nun’s Clearing). 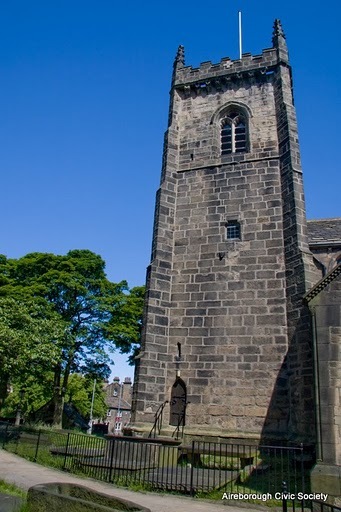 15th Century: Tower of Guiseley Church built. 1522 End of de Ward family line. 1592 Guiseley has its first school. 1601 Former Rectory built (Listed Grade ll*) incorporating parts of earlier timber framed building. 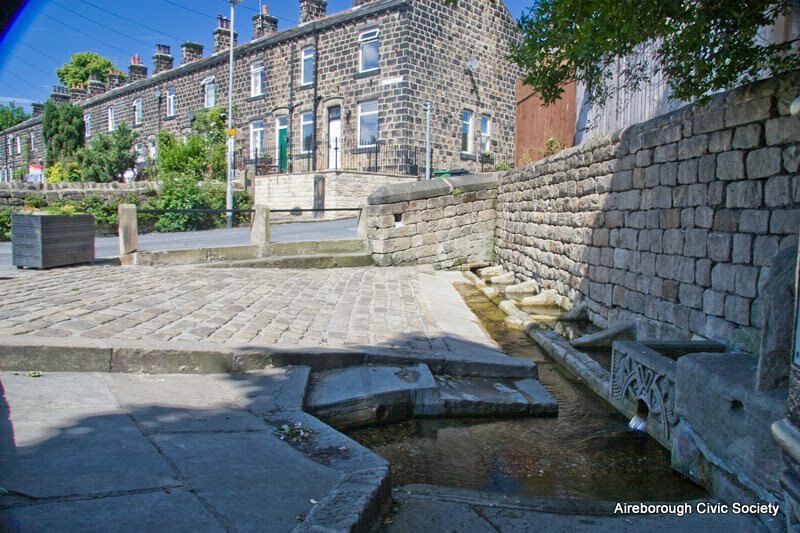 During this period Guiseley Wells provided all the water used by the community. 1696 Enclosure of medieval strip fields. 1812 Patrick Bronte and Maria Branwell, the parents of the famous literary Bronte family were married her at St Oswald’s Church, Guiseley on 29th December 1812. 1825 St Oswald’s school existed. Methodist school opened in Orchard Street. 18th Century: Cottage woollen industry expanded. Weavers’ cottages from this period found in area and have well lit upper storey workshops. Mount Pleasant Terrace one of the last to be built as weavers’ cottages – just as factories were taking over. Guiseley changed from a rural community into an industrial town. 1830 Kirkstall, Horsforth, Rawdon and Guiseley Turnpike Road opened. Trustees: Benjamin Thompson of Park Gate, Richard Barwick of Low Hall, Yeadon & William Ackroyd of Otley. 1842 Spring Head Mill opened. 1851 Population 2,571 in census. 37% worked in woollen trade. 1865 Midland Railway branch to Ilkley via Guiseley. (1876 connection to Bradford via Shipley). 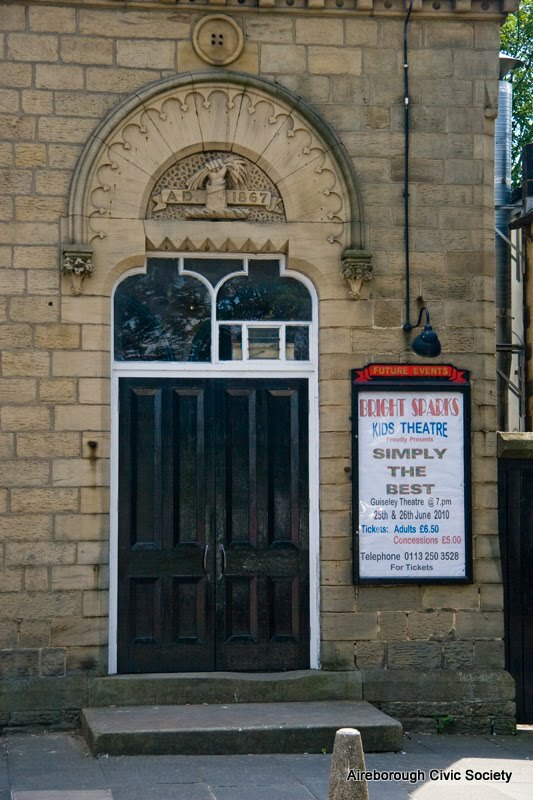 1867 Guiseley Town Hall (now Guiseley Theatre) built. 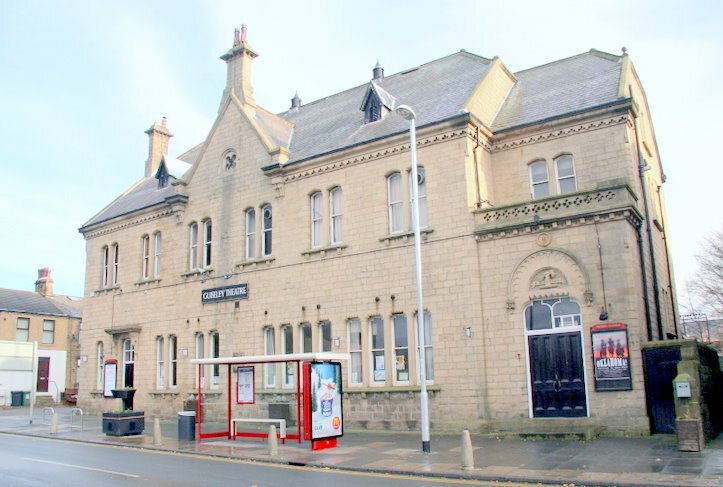 Matthew Thompson of Park Gate (brewer, 3 times Lord Mayor of Bradford, and Chairman of the Midland Railway Company 1879) gave £3000 for the building of the Town Hall and the Thompson Crest is visible above the main door (a hand holding a sheaf of barley). 1860 Ings Mill built – building still there. 1868 Netherfield Mill opened by Abraham Moon & Sons -only mill still operating today. 1868 Nunroyd Mills built by Jonathan Peate, Caleb Peate and Joseph Long. Nunroyd House still there. 1880s Nether Moor boot factory built for Hugh Claughton (factory became Silver Cross Pram factory which closed in 2002, and was demolished for residential housing). 1884-1888 High Royds Hospital built for West Riding County Council. 1909 Leeds Corporation opened tramway to Guiseley (extended to White Cross in 1915). 1909 Guiseley Association Football Club founded. 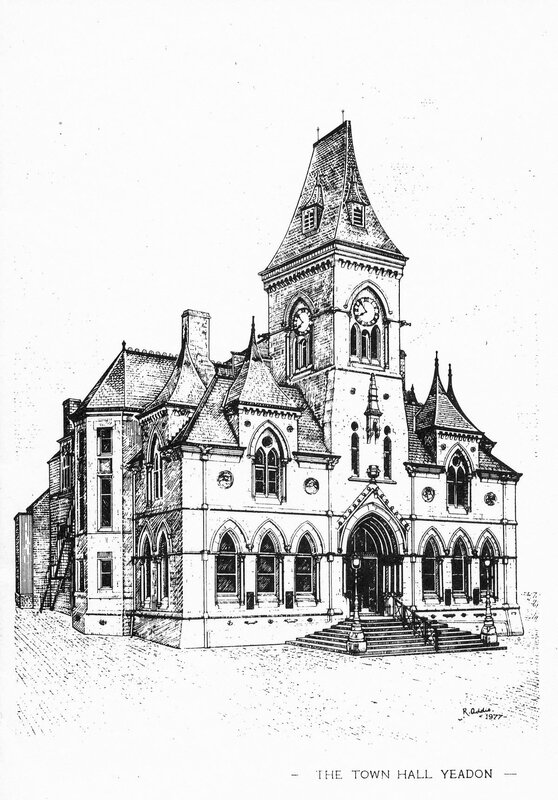 1910 Yeadon and Guiseley Secondary School opened. The name was later changed to Aireborough Grammar School in 1937. The building was closed in 1991 and demolished for housing. Stones from the building proclaiming that it served Guiseley, Menston, Rawdon & Yeadon are in the boundary wall next to the A65. 1913 Spring Head Mills extended – datestone in wall opposite Guiseley Wells. 1927 Crompton Parkinson was formed when Crompton Lighting went into partnership with motor manufacturer F and A W Parkinson. Frank Parkinson paid for most of Leeds University’s Parkinson Building and tower in the 1930s. 1928 Harry Ramsden opened small, wooden lock up fish and chip shop at White Cross (1931 restaurant opened). 1937 Guiseley Urban District Council merged with Rawdon, Yeadon, Hawkesworth & Carlton to form Aireborough Urban District Council with its headquarters at Micklefield House. 1960 Guiseley Secondary School built. 1974 Aireborough became part of Leeds City Council. 2004 Brook Crompton industrial motor manufacturer closes its Netherfield Road site with loss of 225 jobs. Electric light manufacture had stopped in 2002 at Crompton Lighting. The site was cleared for housing in 2006, but the distinctive clock has been re-sited in the car park opposite the former factory site. Essential reading with good photographs and historical maps as well as detailed information. Bygone Guiseley: by Wallace Cooper (1995) – in all local libraries at Dewey reference 942. A detailed history up to 1918.